Manuel Jose (Emmanuel Josef) and wives memorial and grave at Tikapa Marae on the Waiapu River, Tikitiki. Te Wharau beach beyond. 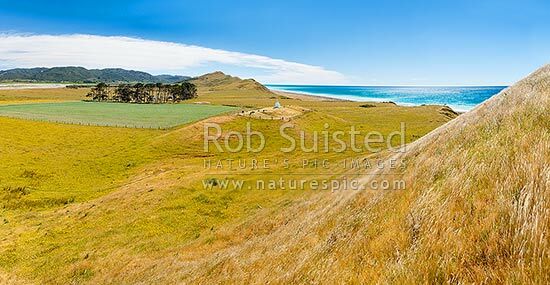 Panorama, Port Awanui, East Cape, Gisborne District, Gisborne Region, New Zealand (NZ), stock photo.